Wanted to give you a heads-up on this awesome resource for coaches you can get for FREE today.Free #1 Best-Selling Book for Coaches – Get It Here! 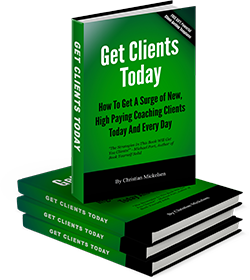 My friend and business buddy, Christian Mickelsen is currently giving giving away his #1 Best Selling Book, “GET CLIENTS TODAY” for free. Get the #1 Best-Selling Book for FREE here! Get all the goodies for FREE for a limited time! Especially if you ever feel insecure or lack confidence when it comes to growing your business. You’ll be blown away when you discover how easy it can be to start attracting your ideal clients right now! Get the Book, Pre-Written Emails and Instructional Video FREE here for a limited time.